Lush Party NA Did you attend? So did anyone go to the Lush NA online chat party last night (No idea what I’m talking about? Click here for details!)? Sadly, I was unable to attend as I got home really, really, really late after a longggggggggggggggggg day at broker meetings! Snore, Yawn, Boring! I wish I could say that I had even a second to log in and partake but sadly it was a no go for me! I did wander over to the website and it appears nothing of great interested was offered aside from Snowcake Solid Perfume. Other then that nothing really, super special or limited got made! 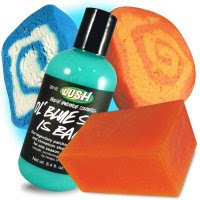 Ol’ Blue Skies Shower Gel is back (If you’re new to Lush this was a shower gel that was introduced last year for Christmas last year and when the new Christmas goodies were released for this year’s Holiday Season, Ol’ Blue Skies, was not part of the line up! 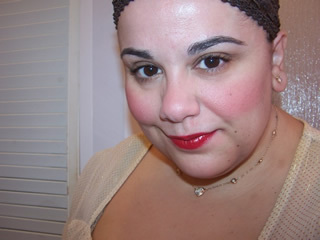 So…here it is if you want it but I personally suggest steering clear unless you adore deep earthy scents!)! I’m not excited. It has patchouli in it which means it smells like just turned dirt. I’ll skip. Snowcake Solid Perfume wahooo! The perfume solids were introduced way before the Holiday goodies this year so when the Holiday releases popped up the only solid that was “holiday” themed was Champagne Snow Showers! Much to my dismay and fans everywhere we wondered what could have happened to the idea of having a Snowcake Solid Perfume! Well…here it be ladies! I was faced with the dilemma of ordering from Lush from the US this morning as Lush UK does not carry Snowcake Solid Perfume! It was released special for the party! If you adore smelling dirt with a bit of oranges thrown in this would be a great pack for you! You’ll get Ol’ Blue Skies Shower Gel, Blue Skies and Fluffy Clouds Bubble Bar, Karma Bubble Bar, and Karma Soap! Ooooo all the Muse’s favorites! NOT!!!!!!!!!!!!!!!! I don’t have to remind you how much I love Snowcake we’ve already been through it enough already right? In honor of the chat party a lovely pack was made up which consists of all good things Snowcake scented! 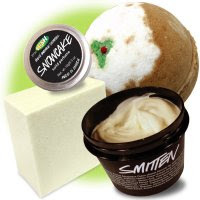 You’ll get Snowcake Solid Perfume, Lush Pud Bath Bomb, Smitten Handcream, and a chunk of Snowcake Soap! Sweet! Sadly, nothing at all to get too hyped over! I definitely joined the fun, although I was just recovering from being very very ill.
Those chat parties can be rather overwhelming! However, I have quick fingers apparently. I snagged two bottles of Ghost shower gel. Some LUSH product trivia, which was easy as I am a bit obsessed…@[email protected] The focus of the party was “The Nanny Diaries,” and much of the trivia was related to that. So I couldn’t answer. Luckily, a lot of people won..er…the Ol’ Blue Skies Pack. Ick ick icky. I can’t touch patchouli; it turns to smelly hippie wet-dirt on me. I hope you’re better now!? Sorry to hear you were ill! The parties are very overwhelming as people are speaking over each other and such! Fantastic! Nice win! I really like it! It’s so thicky and creamy and smells quite lovely! YUK! I HATE Blue Skies! People go ape sh*t over it but I can’t stand it! I agree it smells like dirty wet hippie! NA always screws up on everything RANT SIGH! Aw cool! The door prizes sound great! I love when they do free stuff hehe 😉 Ne Pas Worry is sadly going bye bye so it’ll be nice to have one! What else did ya get? !